2 drawings, 32 steps, an online & print work. Sumi Ink Club is a Los Angeles-based drawing collective founded in 2005 by Sarah Anderson and Luke Fischbeck. The group meets regularly to execute topsy-turvy, detailed, collaborative drawings using ink on paper. 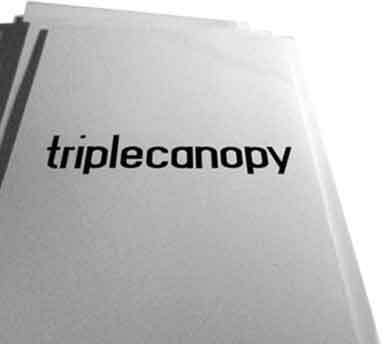 Sumi Ink Club's collaboration with Triple Canopy exists online and in book form. Both versions feature two of the group's drawings, each of which has been enlarged, divided into parts, contracted, and reconfigured. The resulting discrete, yet interconnected, segments manifest varying levels of distance from or closeness to the original ink drawings from which they were extracted. Digital and print incarnations of the project prompt different modes of spatial and temporal engagement with its components. Encountered across multiple forms, "Woven Waves + Sumi Cinema 1" modulate between order and fluidity. You can order or download a copy from lulu.com or by following the link below.